Leading Australian manufacturer of quality sealing systems, Oz Seals explains the difference between good and bad seals. By themselves, seals may appear expensive but add up to only a fraction of the cost of the equipment they protect every day. According to Oz Seals, average quality seals are made with average quality raw materials, which ultimately impact the performance of the equipment. Even a premium raw material such as polyurethane (PU) may not always be so. 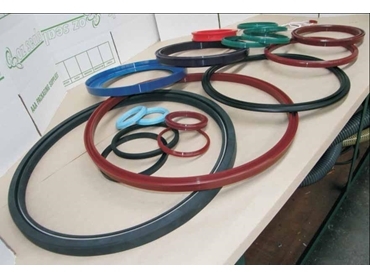 Oz Seals uses only high quality virgin PU raw material for all their seals. All Oz Seals PU materials are polyether-based, offering higher hydrolysis resistance and better flexibility at lower temperatures than polyester-based polymers. Designated as super polymers, Oz Seals seal stock is also unique in that they are thermoset and spin cast, using the company's proprietary Poly4 four-component processing plant. This unique production plant is a fully enclosed process, working in a controlled atmosphere with inert gases to prevent contamination. The plant is also highly accurate and able to safely handle difficult pre-polymers and curatives than other processing plants. Application of heat is part of the process to ensure bubble-free polymer. The resulting moulds go through a further spinning process. Conventional thermoplastic polyurethanes are injection moulded and can use up to 60% recycled materials. Oz Seals uses only 100% virgin raw material to produce a stable and void-free base stock. Thermoplastic material is also less stable than thermoset material. Injection-moulded seals soften rapidly as temperature increases, which leads to extrusion and nibbling failure patterns in the stock. Injection moulding also tends to create voids inside the seal as it is moulded, which can cause the sudden failure of seals. Additionally, injection moulding is not economical on short runs. The lower tooling cost of thermoset spin casting allows Oz Seals to produce short runs and one-seal production of speciality seals.